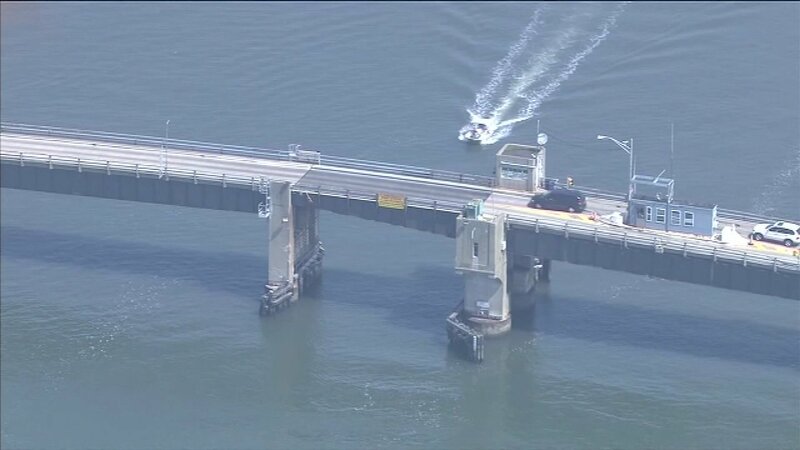 LOWER TOWNSHIP, N.J. -- - A driver was forced to gun his engine and jump a drawbridge that began rising as he crossed it with his family. Terence Naphys, of West Deptford Township, had paid the toll to cross the Middle Thorofare Bridge with three family members in his vehicle on Aug. 1. The bridge links Cape May with the Wildwoods near the Jersey shore. As he was crossing the steel grate, it began to rise 3 to 6 feet (0.9 to 1.8 meters) because a vessel was trying to cross, police said. "My wife said, 'I think the bridge is opening,'" Terence Naphys told KYW-TV in Philadelphia. "He accelerated, and of course then we landed with a big impact on the concrete on the side," said Jackie Naphys. Police said the landing caused minor damage to his vehicle. No one was hurt. Authorities said the operator of the bridge was to blame for the scare. "An employee for the Cape May County Bridge Commission stated that a large vessel was approaching the bridge and they had no contact with that vessel due to their radio being down," police said in their report. The bridge tender told police he activated the bridge's lights and gates in anticipation that all vehicles would be clear. However, he wasn't sure because of sun glare. Terence Naphys said he would never cross the bridge again.